In conjunction with De-Licious, of Glenrothes, and the New York Sandwich Company, of Kirkcaldy, we will be offering a selection of hospitality packages to suit all requirements from small groups to large parties. 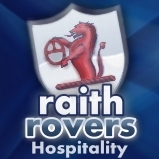 Our match day hospitality packages are a great way to have a fun day out with family, friends and/or colleagues allowing you the opportunity to watch the football and sample great food and drink from our local caterers in the Raith Suite. We will also be offering drinks packages along with the hospitality offerings for those not wishing the pay bar option. For more information or to book your space, please contact us at hospitalityraithrovers.net or call 01592 263 514 option 2.